Multilingual actor John Kokken has married his sweetheart and actress Priya Ramachandran on Monday, 15 April. Actor Anish John Kokken, who was recently seen in Rocking Star Yash's KGF, has bid goodbye to single-hood as married actress Priya Ramachandran. The celebrity couple tied the knot on the auspicious day of Vishu on Monday, 16 April in Kerala. The couple have tied the knot without media glare and the news of their marriage was out only after John Kokken announced it on his Instagram account. 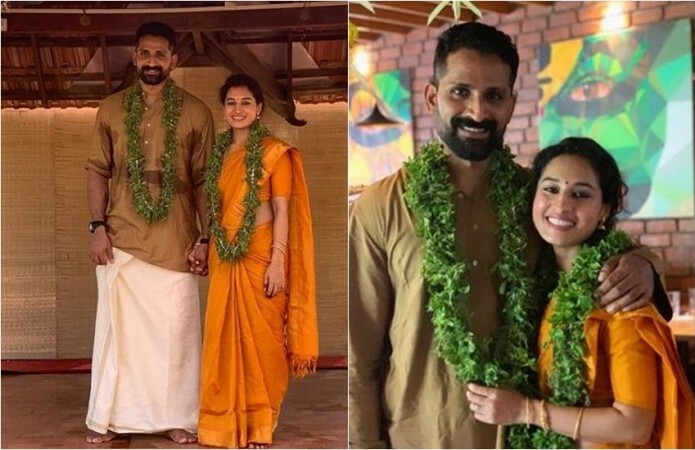 He posted a picture and captioned, "On the auspicious occasion of Vishu this year on the 15th of April 2019, I married my best friend, my mallu girl @pooja_ramachandran in true Kerala style . Our journey begins.... #love #happy #bestfriend #mallucouple #marriage. [sic]"
John Kokken and Priya Ramachandran have been in love for some time and they were quite open about their relationship. The actors, often, shared their pictures on their social media sites which was a clear indication of their affair. John Kokken hails from Maharashtra and worked in different film industries. His well-known movies are Nenokkadine, Baahubali and KGF. He was earlier married to actress Meera Vasudevan. This wedding ended in 2016 and they have a son from his first marriage. On the other side, Maliyali Priya Ramachandran, who was born and brought up in Bengaluru, won several beauty pageants that include Miss Coimbatore and did several TV commercials, before foraying into films. After making her debut in Mollywood film, Yathrakarude Sradhakku, she was part of a few Tamil and Telugu films. It has to be noted that she was a wild-card entrant in Bigg Boss Telugu 2. Earlier, she was married to a VJ and their wedding ended in 2017.